Peter Todd is arguably Australia's most renowned guru of New Vogue dancing. Winner of many awards, including the coveted Brolga Awards for best coach and in recognition of his leadership skills and devotion to dancesport, Peter is an inspiration to all that know him. Peter Todd's professional career boasts titles of 8 times Australian champion, 5 times South Pacific champion, and 3 times Australian Professional champion. He is also a renowned national and international adjudicator, and coach to a myriad of Australian Professional New Vogue Champions. Peter Todd is a former National Chairman and President of the Australian Dancing Society, and much in demand as Master of Ceremonies at major competitions, including The Melbourne Australian Championships each December. 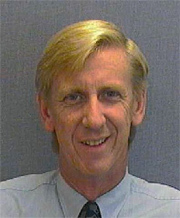 Peter Todd currently coaches at Carol Kimmins Dance Centre at Condell Park, where his personal charm, unparalleled coaching skills, and encouragement of his students ensure Peter is never without a waiting list of dancers seeking to have him as their preferred coach.